Get inspired by everyday objects. 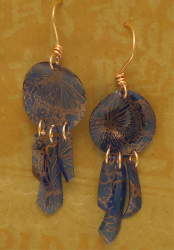 Blue Bling Water Bottle Earrings from Candace Jedrowicz can be created by combining a plastic blue drink bottle and copper enamel ink. Everyone will be shocked when they find out these earrings are repurposed from a water bottle! Keep both circles and squares with the curved side down during the whole process. 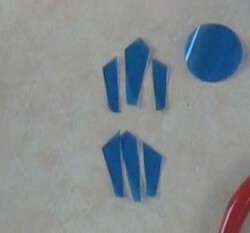 Cut two 1″ circles and two 1″ squares from the bottle. Punch 1 hole at the top of the circles and 3 holes at the bottom. 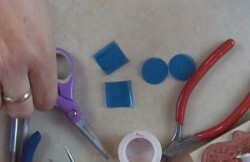 Cut each square into 3 odd shapes for the dangles. Punch a hole in the top of each dangle. 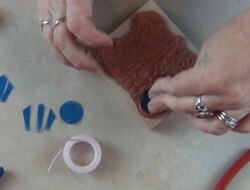 Ink the stamp with the pigment ink and press both circles on to the stamp. Lay the dangles together to stamp. 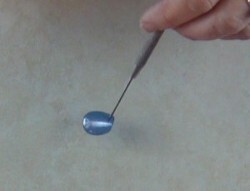 Holding each piece with a needle tool, heat with the heat tool held about 5″ from the table. Keep the heat on until the piece curls up a bit. 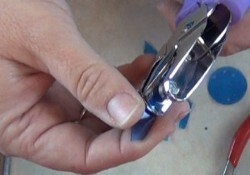 Use the needle tool to gently press the piece while heating with the heat gun, until it is only slightly curved. If the ink rubs off, it needs more heat. Keep the heat at a 5″ distance until the ink looks super shiny. 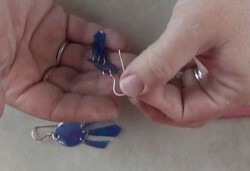 Use 6 jump rings to attach the dangles to the circles. Use 2 pliers to hold each jump ring. Bend the ends of the ring to the side, slide a dangle and one hole of the circle onto the ring and close tightly. Cut a 2 1/2″ wire for each ear wire. 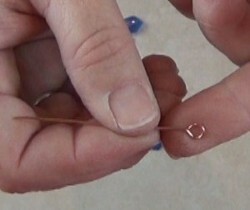 Using the round nose pliers make a ring on one end. Bend the wire perpendicular to the ring. Slide the circle onto the ring and close. Slide a tiny bit of coiled wire on the wire and make a sharp bend above the coil so it won’t slide off. Bend the remainder of the wire over the handle of a pair of pliers. 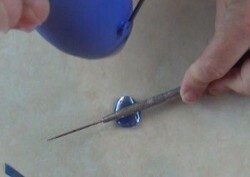 Gently sand the sharp edges of the wire ends. 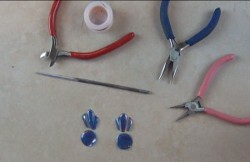 For a comprehensive video tutorial of this project, check out How to Make Dangle Earrings from Blue Water Bottle. What a unique idea. I have not seen anything like this. They are different and I am all for that. I like having one of a kind pieces. I love his easy they are to make and the directions are not only written but done up in step by step pictures too! I love this project! I'm all for recycling & this is a great way to have a new pair of earrings! Now to find a blue water bottle. LOL!